This is a Willamette Valley native form of Buckbrush found in the SW part of the Valley. This species is found historically from the Portland/Oregon City area in the Willamette Valley and throughout the southern half of the state well into California. It has lost large areas of its northernmost natural range to development. Thats a pity because this is a fantastic native shrub for hot dry sites. It is now employed by ODOT for freeway plantings and we are happy to see that. A large, angular evergreen shrub with small deep green paddle shaped leaves. 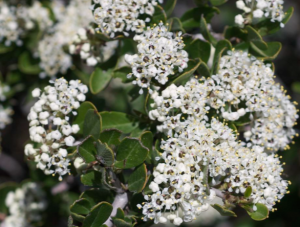 In April the whole shrub is swarmed with pure white flowers.This is a beacon to all pollinators and the sweetly fragrant flowers will literally be buzzing in bloom. Fast growing incredibly tough shrub for areas of intense drought and reflected heat. To 8′ x 8′ very quickly in any soil that does not become boggy. Excellent performance in tough urban situations. Irresistible to bees and butterflies. Extremely cold hardy to below 0ºF. No summer water. Moderate deer resistance. Oregon native plant.